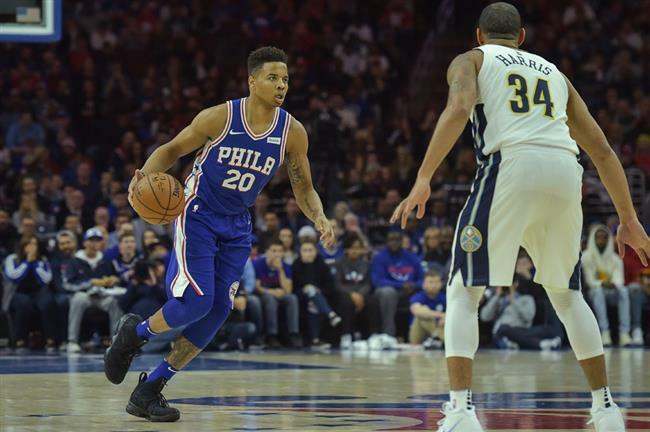 Former first-overall draft pick Markelle Fultz delivered 10 points in his much-anticipated return as the playoff-bound Philadelphia 76ers crushed the Denver Nuggets 123-104. Philadelphia 76ers guard Markelle Fultz dribbles the ball as Denver Nuggets guard Devin Harris defends during the first quarter of their NBA game at the Wells Fargo Center in Philadelphia, Pennsylvania, on Monday. The 76ers won 123-104. FORMER first-overall draft pick Markelle Fultz delivered 10 points in his much-anticipated return as the playoff-bound Philadelphia 76ers crushed the Denver Nuggets 123-104 on Monday. The return of guard Fultz, who was a top pick in the 2017 NBA entry draft, comes a day after the 76ers clinched their first playoff spot in six years. Joel Embiid scored a team-high 20 points and grabbed 13 rebounds and guard Ben Simmons had 7 points, 13 rebounds and 11 assists for the Sixers, who recorded their seventh straight win to move within one game of third place in the Eastern Conference. With 10 games left in the regular season, Philadelphia will use that time to determine how Fultz can fit into its playoff plans. Fultz played 15 minutes as backup to Simmons and finished 5-of-13 from the field with 8 assists and 4 rebounds in his first game since October 23. It was just the fifth career NBA game for Fultz, who was initially diagnosed with a right shoulder problem, then told he had a scapular imbalance. But with its first playoff berth since 2012 safely tucked away, the club decided it was time for Fultz’s season debut. Fultz checked in to a standing ovation from the crowd of 20,500 at the Wells Fargo Center in Philadelphia with 2:54 left in the first quarter and drove down the baseline for a quick basket. Will Barton led the Nuggets with 25 points. In Charlotte, Kemba Walker moved a step closer to becoming the Hornets’ all-time leading scorer with a 31-point performance in a 137-128 overtime victory against the New York Knicks. Walker was 4-of-4 from the field as he carried his team over the hump in the extra session on Monday. He is now 20 points shy of breaking Dell Curry’s franchise scoring record and is in position to do so at home against LeBron James’ Cleveland Cavaliers. Trey Burke scored a game-high 42 points for the Knicks, who fell to 27-48 on the season. Elsewhere, it was: Pistons 112, Lakers 106; Celtics 102, Suns 94; and Grizzlies 101, Timberwolves 93.